Can you believe it's almost already the middle the November? This year has flown by for us, and before we know it, we'll be experiencing winter and all the fun that comes with it. This includes playing in the snow making snowmen, having snowball fights, sledding, and drinking hot cocoa by the fireplace. One of my favorite things to do in the winter as a kid was playing outside with my brothers, we didn't always get much snow in Texas but when we did it felt Christmas morning all over again! While playing in the snow is so fun, it's also cold and one of the worst feelings is your hands, wrists and skin hurting because of coming into contact with cold snow. Don't you just hate it when you get snow up your coat sleeves and onto your skin? Well, I'm excited to introduce you to SnowStoppers, made by Veranda Outdoors. They are waterproof mittens and gloves that have an extra long cuff to go up your arms, to keep your forearms warm and dry! 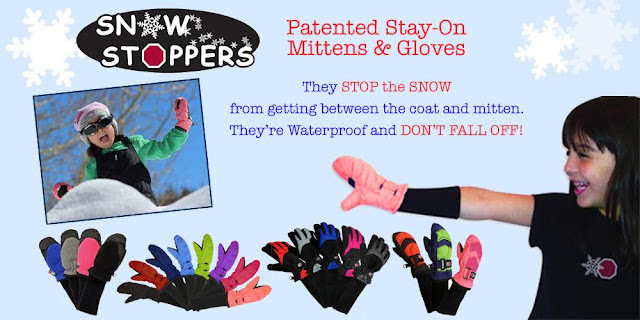 There are SnowStopper mittens and gloves that you can get for your whole family! They come available in sizes small enough for a 6 month old baby and go all the way up to sizes for adults-- because we adults love to play in the snow too, as well as ski and snowboard! Not only is there a great selection of sizes to choose from, but there are also lots of fun colors to choose from! With winter quickly approaching, be sure to head on over and check out all the great SnowStoppers Veranda Outdoors offers! These extra long cuffs look like they will really come in handy when playing in the snow this winter! Stay connected with Veranda Outdoors on Facebook, Twitter and Pinterest! 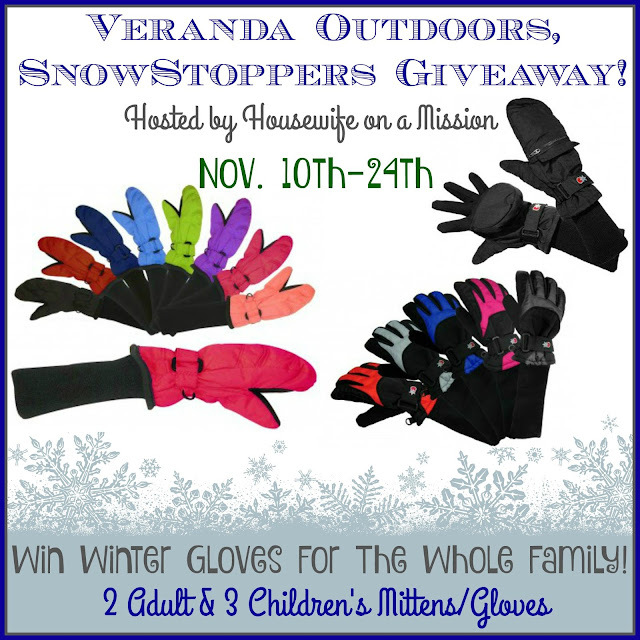 One of our readers are going to win a set of gloves for their family of 5 (2 adult & 3 children mittens/gloves)! I would love to win the SnowStoppers® Ski and Snowboard Gloves for my grandson. These look like they would be wonderful for our family during the snow filled New England winters!! The Panda Knit Hat is adorable too!